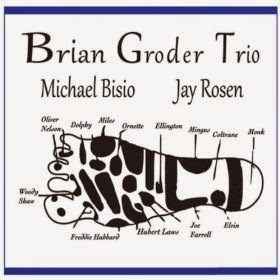 Trumpeter Brian Groder's trio with bassist Michael Bisio and drummer Jay Rosen is a real treat. Their album Reflexology is an expertly crafted mix of composition and improvisation that delivers something more than a sum of its parts. Lacking a chordal instrument, the trio has a lot of space to fill, which they do - to some extent - while sticking to a more traditional jazz vocabulary. By this I mean, the musicians don't veer into extended technique or over-blowing to fill space, but rather through clever phrasing and counterpoint they connect the dots, still leaving plenty of breathing room in their music. Groder has a clear limpid tone and uses it to deliver his melodic ideas with precision, while Bisio and Rosen work together to ensure the type of solid foundation that reveals their years of playing together. The opening track 'What Not' begins with a tense syncopated melody that plays against the counter motion of the sparse rhythm section. After a few moments, the group moves quickly into improvisation, interacting with aplomb. Another highlight is 'Veer,' about half way through the album. Bisio's simple but effective bass line is captivating as it underscores Groder's thoughtful playing. The bassist's own turn at the helm is just as effective, as he locks in tightly (but not to tightly) with Rosen with an evocative solo. 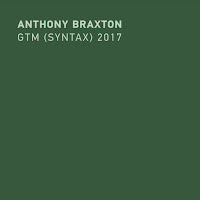 Additionally, the track 'Tarried Breath', which seems like the most freely improvised track on the recording, kicks in with the bass, textural percussion and a languid melody that lingers hauntingly long after it ends. Delicate and tastefully done, Reflexology is a solid and enjoyable album. Marvellous stuff, I really enjoyed that. There's still plenty, of life left in improvising on heads. And what a great drummer Rosen is: what he can do with just a snare and a cymbal! You give this yawn-inducer 4 stars, while Fred Van Hove, Sheldon Siegel, and People, who continue to move the state of the art, get 3.5. That's very disappointing. Among other things, some of your contributors seem to have a bias towards nice and tidy music, and they have pushed the blog to the middle of the road. MOR free jazz? Apparently. That assumes that moving the state of the art – pushing back boundaries – is of and in itself a good thing, and better then music that doesn’t. I find that a highly dubious proposition, unless you’re of the view that the weirder it sounds the better it must be, which is a pretty shallow judgment. There’s no necessary correlation between originality and quality. Also, Paul gave this album 4 stars, but the other albums you mention were given 3.5 stars by different reviewers. One would not expect them to exercise their judgment in exactly the same way. There’s no uniform code as to how albums should be rated. Finally, MOR free jazz? I never thought I’d hear that. The impression I get is that a huge variety of music is reviewed on this blog, and it’s impossible to pigeonhole it into any particular genre or sub-genre (many of which I’ve never even heard of). Indeed, I suspect that for many, some of the albums reviewed might not even qualify as free jazz. Not that it really matters. Thank you for proving my point Colin. 1) "moving the state of the art – pushing back boundaries – is of and in itself a good thing, and better then music that doesn’t. I find that a highly dubious proposition..."
That's the mindset I am criticizing. I don't find that a dubious proposition at all. What's dubious about it? I find playing it safe dubious. 2) "There’s no necessary correlation between originality and quality"
Yes indeed, give me originality any day.By "quality" you must mean unoriginal, since you pose it in contrast. 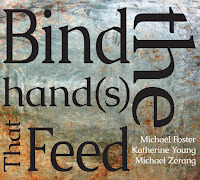 Nice, neat, within-the-lines seems to get the nod these days on the blog. 3) "Indeed, I suspect that for many, some of the albums reviewed might not even qualify as free jazz." I couldn't have put it better, but was reluctant to make such a sweeping generalization. But yes, this is what I find so disappointing about the direction of the blog. I can't say if the various contributors are giving the blog a different identity, or the blog is conforming contributors to an "acceptable" critical position. I do think it really matters in a blog called "free jazz." If it's no longer about free jazz, then change the name. You're welcome to MOR. I must say that this album is not exactly my cup of tea although the musicianship is great and I can understand Paul's words. The rating system is something we could endlessly discuss about. I must admit that I haven't heard the Van Howe (who I deeply admire) or the Sheldon Siegel albums but I have listened to the People album which I found rather disappointing and - if you really want to stick to the term - much more mainstream than the Brian Groder Trio. 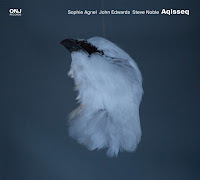 Finally, I guess you it is hardly possible to use the term MOR to this kind of music, even if I have reviewed more accessible albums myself (Colin Vallon, Fennesz etc.). I would agree with Colin that the quality of the music cannot be judged by its strangeness (we have had this discussion among the reviewer team when we talked about the "Most Innovative Listening Experience Award"). Almost everybody can agree on Coltrane, Miles, even Ayler or Brötzmann. Are they Middle of the Road artists? What about Matana Roberts, who has become almost everybody's darling? On the other hand it is nice to have a dissenting opinion. Hi AGM - as you know the stars have always been a point of tension, especially since the blog opened up from a one man show to an evolving collective of reviewers. As Colin says, it's difficult to relate the star ratings across both reviewers and musical genres. Personally, I try to give a sense of the type of music in the review first and then apply stars to in relation to what I've reviewed and enjoyed as the star ratings are subjective to the reviewer's perceptions. 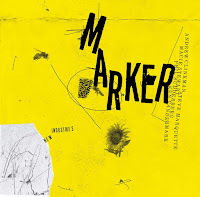 The blog covers challenging albums like People or Rempis/Marhaug as well as some more 'inside' recordings like this one. I hope the diversity of music keeps the blog interesting, as it's what drew me in here a few years ago when I was seeking new music and some sort of introduction to the vast array of it. Anyway, we're always open to suggestions and I read your comments with great interest - send an email to the blog address, would like to get some of your thoughts on upcoming musicians and recordings. AGM, the point I was making is that pushing back boundaries is neither a necessary nor a sufficient condition for the music being any good (which is what I mean by “quality”). Some music that does this is good, some not; likewise with music that doesn’t. A moment’s reflection will confirm this must be correct. Let’s look at the albums positively reviewed since this review: Black Pus, Jemeel Moondoc, Talibam! & Weasel Walter, Peter Brötzmann, Jason Adasiewicz, John Edwards & Steve Noble. Are you seriously suggesting that these fall within your description? I suppose you might think the Moodoc album qualifies, since it uses a head/solo structure: hardly ground breaking. Are you suggesting that for this reason it doesn’t qualify as free jazz and/or that its lack of originality means that it can’t be any good? 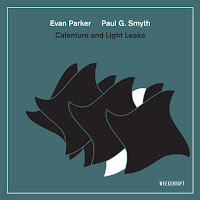 If so, the same would apply to mist of Ornette’s 1960s work, and Coltrane’s, Ayler’s...right up to William Parker. That would seem odd. There is no “acceptable” critical position on the blog, as you must know from having contributed reviews yourself. Not only would it be undesirable, but how on earth could Stef and Paul implement such a policy? In fact, you’re coming dangerously close to advocating exactly that. What troubles me is a view – which I accept, you may not share – that the arts progress like science, each stage being necessarily better, and an improvement on the past, and that one needs to push things further, or adopt more extreme positions, in order to further that progress. I accept that in order to make music that is fresh, one must to a certain extent “make it new” (as Ezra Pound put it) but there are many ways that can be done, and newer doesn’t necessarily mean better.